Planning a trip can be overwhelming. There are a lot of details to remember, from insurance to vaccinations and everything in between. This guide makes it easy, just follow the chart until you reach the end. Do you have photocopies of your passport? It’s important to make photocopies of your passport before traveling. If you have a photocopy of your passport, it will be easier to get a replacement passport should the original go missing or become stolen. We recommend you keep one copy on you and one in a safe place while traveling. Are you aware of any Canadian government-issued travel advisories for the destinations you are visiting? The Canadian government issues information on situations that may affect travelers’ safety and well-being. View any issued travel advisories here. Are you aware of the necessary vaccinations for your destination? Some vaccines are required for you to travel. Protect yourself by finding out what vaccinations are needed for your destination. You can view the list here. Find your nearest vaccination facility here. When traveling outside of the country, you should always ensure that you have sufficient coverage. Save yourself the hassle of expensive medical bills or the possibility of being denied medical treatment by purchasing a travel insurance policy that best suits your needs. You can find an affordable plan here. Print out a copy of your policy to carry as proof when traveling and remember, your personal credit card may not cover everything so give them a call to verify before you travel. Do you have an emergency medical contact card? Pack an emergency medical card and take it with you everywhere you go. Your card should contain information on allergies, supplementation, medications and more. Print a card here. Make sure it’s protected so it doesn’t get wet. Are you taking medications or special medical devices with you? Prescription medications and/or devices like sleep apnea machines may come under scrutiny by foreign officials. Read more information here. 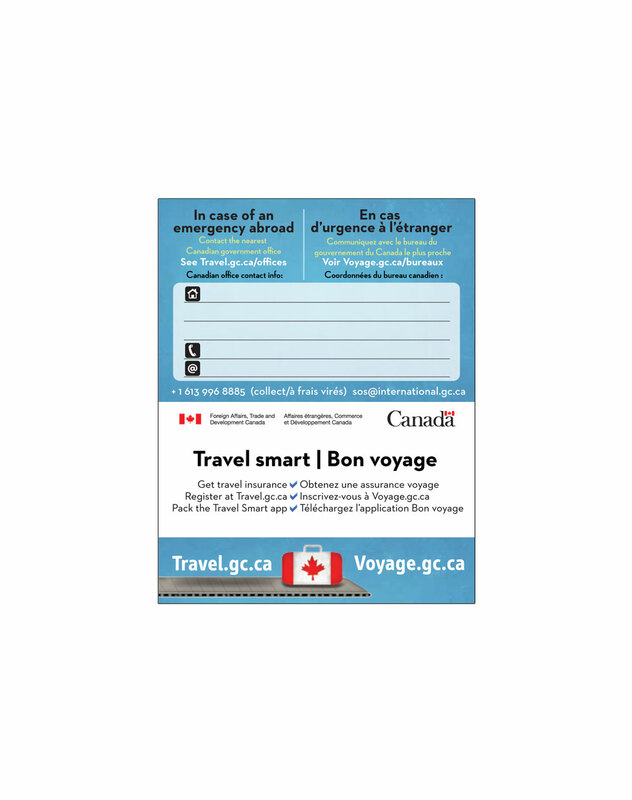 Did you register with the Registration of Canadians Abroad? Stay connected to Canada in case of an emergency abroad or back home. Register here. Do you have the address of the Canadian embassy in the country you are visiting? Be prepared in case of an emergency, such as a lost or stolen passport. This should always be considered a safe house if you’re lost or need somewhere to go if in distress. Find the address here. Do you know how to contact Emergency Services abroad? In Canada, we know to dial “9-1-1” in case of emergency. The number to contact Emergency Services aboard varies by country. Find the phone number for your destination here. Are you planning to drive while abroad? Your Canadian driver’s licence may not be valid where you are traveling. Apply for an International Driving Permit here to avoid denial of a rental vehicle and/or any fines. Have you sent your itinerary to family or friends at home? Send an itinerary and hotel information to your family or friends at home so that someone is aware of your whereabouts. Have you notified your credit card company of your travels? Call your banking institution and credit card company before you leave so they know to expect purchases from a foreign country. Your bank and credit card company will make a note in your file so you won’t encounter any problems while abroad. Do you know the local laws and customs? You are subject to the local laws and customers while you’re abroad. Research what is legal and what is illegal before you travel. Do you know the basics of the local language? It’s always beneficial to know the basics. Purchase a phrase book at your local bookstore or find a great app on your smartphone (if you’re taking it with you). Are you aware of common scams that occur in the country you are visiting? Know what to be on the lookout for. Read about common tourist scams here. Do you have a money belt? A money belt is a small zippered pouch that fastens around your waist under your pants or skirt. Avoid theft by carrying your valuables in a money belt. Did you pack a travel health kit? A basic travel health kit is important for all destinations. Be prepared with first aid supplies, medications and other necessities. Refer to this list to help you pack your travel health kit. Is your flight longer than 8 hours? Travelers flying for longer than 8 hours are at higher risk for blood clots (Pulmonary Embolism). Stay hydrated, wear loose fitting clothing and stretch your legs and arms every hour. For more information, click here. Do you have a map of your destination? In case you get lost, always print out a map of your destination. Have you protected your home against burglary? Limit what you post on social media and remember to stop your mail while you’re away. You’re all set! Enjoy your trip!